Second largest fresh water lake in Myanmar, located about 1Km\3000 ft above sea level in Southern Shan State; surrounded by mountains at east and west. The lake is famous for its sceneries, local people’s unique way to row their boat by leg and their floating farms. It is also part of the UNESCO BIO SPHERE for conservation of endanger species. Visitors can go around the lake to visit local villages,religious sites and markets (which move from place to place every five days in routine). Trekking or biking around Inlay lake is also very popular among tourists. People also like to visit nearby towns such as Kalaw, Pindaya, Taunggyi. Shwe Oo Min caves are situated at the western side of Pindaya town, about one hour drive from Heho airport. Pindaya and its surrounding are semiautonomous region of Danu people from Shan State. The caves are formed on the eastern side of the hill, stretching from north to south, at the altitude of 4970 ft\1.5 km.The southern most cave is the largest and most visited by pilgrims. It is also the nearest to the stairway and the road. 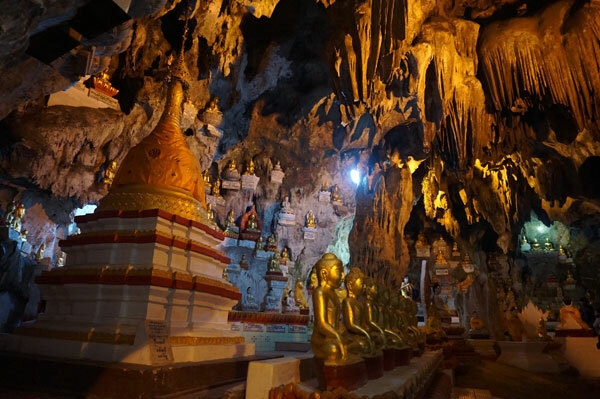 The cave itself is 490 ft\149 m long and filled with Buddha images in various sizes, made from wood, stone, lacquer and metal. There are over 8000 images and the number keep growing. The oldest thing inside the cave is a bell donated by public during the reign of King Tharyarwaddy in 1842. There is also a 75ft\22.8m tall stupa inside the cave near the entrance. Kalaw aka pine trees town is situated at the southern Shan State about 4300 ft\1.3 km above sea level. It is also known as malaria free zone. It was founded by the British as an resort town to escape heat of central plain. It is surrounded by the villages that belong to ethnic Pa-O, Danu and Taung Yo people. They make their livelihood by raising cattles,farming,growing tea and oranges. It can offer a lot of trekking options which can be as long as a few hours to two or three days period. The center of the town has a market which open nearly everyday and swell into bigger size every five days cycle;it is a custom of nearby villagers to come and sell their products. It also has a few religious famous sites such as Myin Ma Hti cave,500 years old Buddha image made from bamboo stripes and Thein Taung hill . 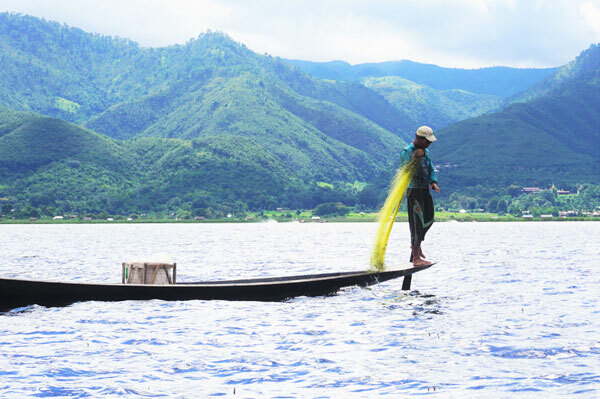 Indein is located at the eastern bank of Inle lake. It is a small village near a cluster of stupas numbering 1054. 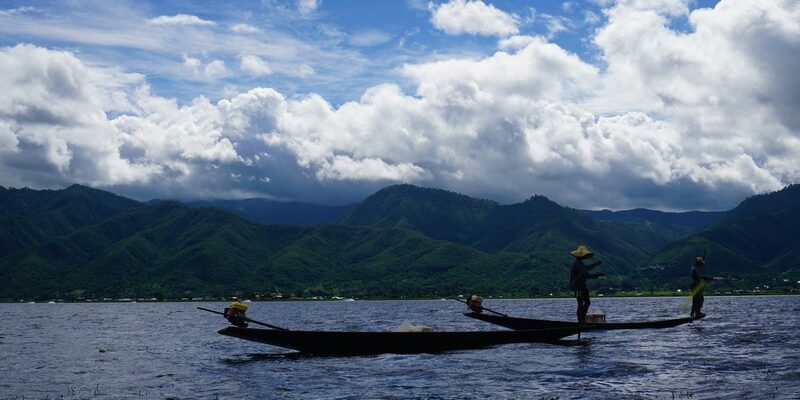 Indein can be reached by car or by boat- sailing in from Inle lake and following the shallow and narrow canal is the best way to reach Indein. Indein pagodas are divided into two groups-one near the canal and the main complex farther up the hill. Some of the stupas were damaged and destroyed by natural elements ,but some of them were rebuilt by government and private donors. The first stupa was said to be built by India’s Emperor Asoka, according to local legend,but the stone inscription left from 1793 pointed only as far as Bagan period. Phaung Daw Oo pagoda is a temple housing five images which are covered with layer upon layer of gold that their appearances disappeared to resemble five gold lump. This images are the most venerated religious artifacts around Inle lake region. 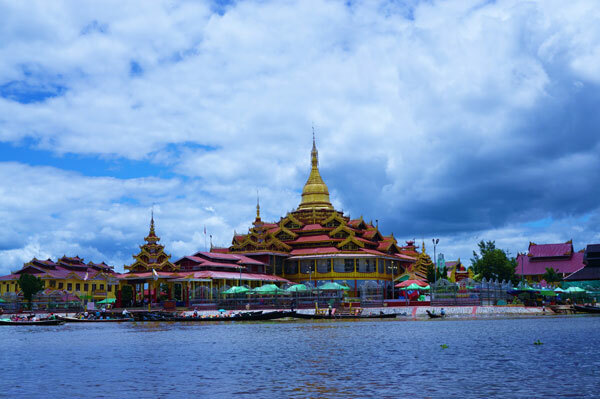 The temple was built since 1956,at the southwestern side of Inle lake. 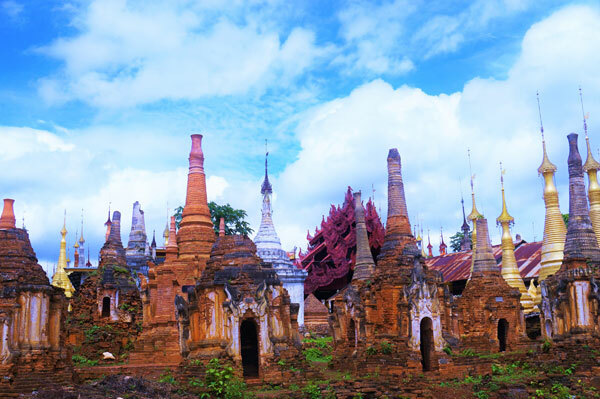 The images were said to be left by Bagan King Alaungsithu of 12th century and rediscovered by people during the founding of Naung Shwe town in 1359. Every year, there is a ceremony of carrying those images around the lake at the end of Buddhist lent,which usually around October. On the western side of the lake,about half way between Naung Shwe and Ywama villlage, lies a monastery known as Nga Hpe Kyaung. It was said to be over 250 years old and one of the attraction of Inle lake. It is famous for its collection of beautiful shrines,which belong to different times and design of Myanmar-Shan, Tibetan, Bagan and Inwa .